As part of its UNOSAT programme, the United Nations Institute for Training and Research recently launched a global report on the geospatial analysis of piracy activities. UNOSAT uses satellite derived geoinformation in critical areas such as humanitarian relief, human security, strategic territorial and development planning. 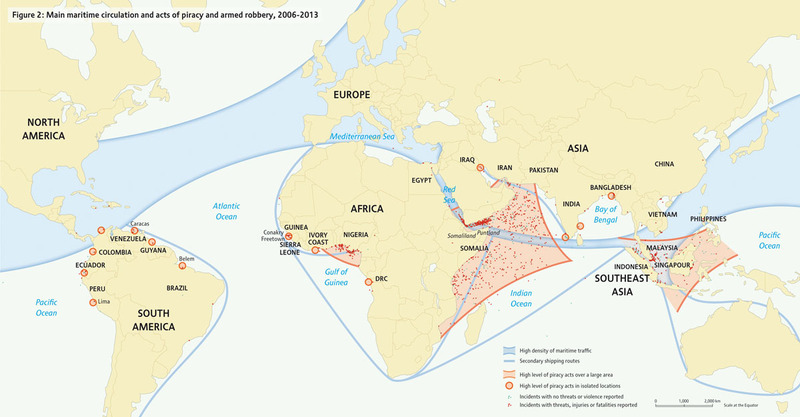 The global report, building primarily on data maintained by the International Maritime Organization, explores how trends in geospatial patterns and severity of reported piracy incidents are developing from 1995 to 2013. Not surprisingly, two areas were observed because of the significant trends in piracy activities: the Western Indian Ocean, including the Gulf of Aden, and the Gulf of Guinea. In the Indian Ocean, including the Malacca Strait, and in South America, no major trends were observed. Piracy in the Malacca Strait, however, continues to be a major disruptor for safe routes in the eastern Indian Ocean. In addition to the well-known feature of piracy “mother ships” from which fast-going skiffs can radiate, a new trend of floating armoury vessels supplying anti-piracy entities with weapons out in international waters is observed. The Financial losses to the national economies for countries with ports in the Gulf of Guinea are considerable. This has forced certain countries to take military action that has proven successful. The findings confirm the already well-known trends in modern day piracy in these areas. Several organisations collect and analyse data relevant to piracy. While there have been major improvements in information-sharing, this is yet another area in the fight against piracy which suffered from fragmentation of approaches and consequently from dispersion of resources. The report thus provide for a number of recommendations for standardisation and possible better coordination. Notably, the report advocates for the creation of a “severity index” to better differentiate the gravity in the use of violence during reported incidents in future data collection and analysis. The report indeed remarks how for close to half of reported piracy incidents no threat of violence has been reported. A similar index is used by the ReCAAP in monitoring piracy incidents in South East Asia. The report also highlights how the distance from the coasts from which the pirate carry out their attacks is correlated to the pirates’ technical and operational capabilities and could thus function as an early predictor of an escalation in the attacks. 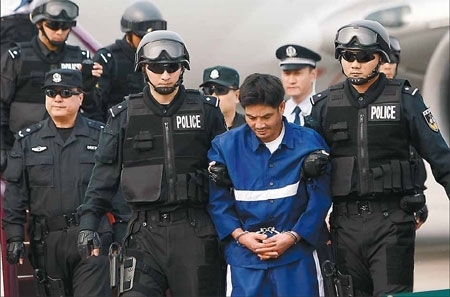 Further to his earlier conviction for the murder of 13 chinese sailors on the Mekong River last year, notorious former druglord Naw Kham has been sentenced to death today by the Intermediate People’s Court of Kunming, in China’s Yunnan province. We blogged on the Mekong River murders here. The incident was one of the deadliest assaults on Chinese nationals overseas and prompted unprecedented joint boat patrols along the river. Three of Naw Kham’s gang members were also sentenced to death, another received a suspended death sentence while one was sentenced to eight years in prison, respectively. They had all pleaded guilty on a 3-day long trial in September this year. We previously blogged about the Mekong Trial here. The defendants were also ordered to pay compensations to the victims families. They all said they will appeal the verdict. 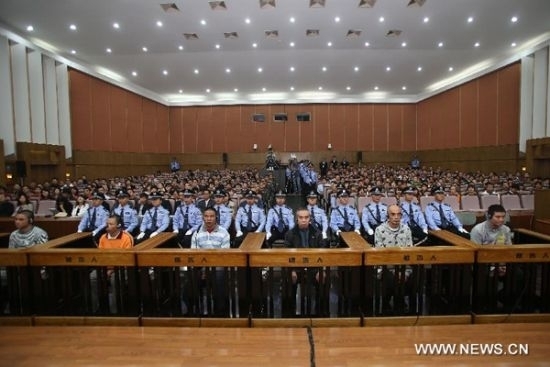 For 3 days at the end of last week, the Intermediate People’s Court in Kunming, the capital of the Yunnan Province in southwest China, was the stage for yet another high profile, yet swift, criminal trial. The case involved the mysterious murder of 13 Chinese sailors on the Golden Triangle’s area of the Mekong River in October last year. We have blogged about the incident here, focusing in particular on China’s unprecedented role in strengthening law enforcement in the strategic Mekong River basin. Since the murders, Laos, Vietnam, Myanmar and even Thailand joined China in holding several military patrols across the lawless boundary waters. The murders, one the deadliest assault on Chinese nationals oversea, sparked a large public outcry in China. It therefore comes as little surprise that the trial attracted much attention from the Chinese press. Among the 6 defendants was Naw Kham (aka Nor Kham aka Jai Norkham),a member of Myanmar’s Shan ethnic minority and a notorious once-untouchable drug lord and gang leader who for years is thought to have ruthlessly run the drug and other illicit trade in the Golden Triangle area. Naw Kham was arrested in April in Laos in another joint military sting operation and traded over to China shortly thereafter. Prior to his arrest, only two blurred pictures of Naw Kham were said to exist. Much of the news regarding the investigation and trial is limited to Chinese media, with only a few outlets providing reporting in the English language. 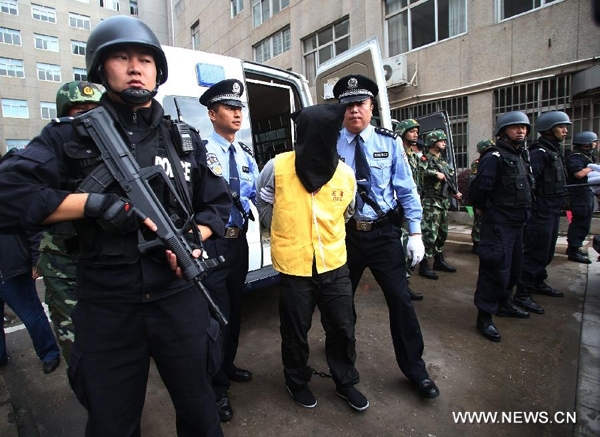 The holding of the trial has been hailed as another example, further to the joint river patrols, of China’s growing concern over cross-border security issues and its novel policy of regional cooperation in combating international crimes. Indeed, it is unlikely that the arrest and trial of the alleged perpetrators could have taken place in such a swift manner without China’s involvement. As discussed in another previous post, most notably this policy included China’s unprecedented participation in the international anti-piracy patrols off the coast of Somalia and in the larger Gulf of Aden area. Chinese media praised the trial as a model of judicial cooperation, coupling armed drug trafficking gangs on the Mekong and Somali pirates as “common enemies of mankind” and calling for their prosecution as a duty of all States. This is a remarkable development in the debate over the universal nature of piracy prosecution but also, leaving piracy aside, in the more controversial debate over modern China’s sovereignty and its role in large-scale international cooperation. However, China’s sudden primary stance in the Mekong murders also seems to be a show of strength in view of other disputes concerning the economic development in the Mekong River basin as well as in other areas of economic interest in Asia. After allegedly confessing his role in the Mekong River murders upon his arrest and recanting it in a recent interview, the media reports that Naw Kham partially admitted knowledge of the murders at the beginning of the short trial, which then concluded with his full admission of guilt and plea for leniency. All other defendants, members of Naw Kham’s gang, promptly confessed their responsibility upon the opening of the trial. They were all accused of murder, drug trafficking, kidnapping and hijacking and now face the possibility of the death penalty. During the trial, simultaneous interpretation was provided in Laotian and Thai to accommodate the testimony of foreign policemen and witnesses from Laos and Thailand. Such testimonies are apparently unprecedented in Chinese judicial proceedings. China asserted jurisdiction over the case upon its direct links with the crimes and the victims as well as within the general framework of regional cooperation within the Mekong River. Chinese media also praised the trial as a demonstration of the efficiency of Chinese judiciary to the rest of the world. From an international justice perspective, however, doubts still remain as to the procedural fairness and completeness of such fast-paced trials whose outcome increasingly relies on the defendant confession. Interestingly, the arrest and trial of Naw Kham seems to have fallen under Interpol’s radar, as at the time of writing Naw Kham still remains on its Most Wanted Fugitive List. According to the prosecution, the Chinese boat refused to pay protection money for safe-passage in Naw Kham controlled areas and the murders were framed as a drug related incident to set an example. Several aspects of the murders, however, remain unclear. In particular, one possibly relevant factual element of the case appears to have been given limited consideration, namely the alleged participation in the murders of 9 members of the Thai military, part of an army unit responsible for security along the Mekong. Initial investigations by Chinese authorities already revealed a role played by a group of Thai military. It is still unclear whether they acted in collusion with Naw Kham’s gang. Investigation by Thai authorities, who are currently holding the soldiers as suspects, appear to show conclusive and corroborative evidence of the Thai soldiers shooting at the Chinese boats once they crossed over into Thailand. What Does Piracy Have to Do with North Korea? The reclusive authoritarian Democratic People’s Republic of Korea is once again back on the news headlines. Surprisingly, this time is not about the reactivation of its purported nuclear programme, or because of a new attempt to lift off a satellite/ballistic missile, or for some leaked information on the poor living conditions endured by its citizens. Media outlets are reporting on the possible hijack of 3 Chinese fishing vessels and the kidnap of their 29 crew members earlier this month. The vessels and all the captives were released today, following the intervention of the Chinese authorities. The incident has all the hallmarks of a piracy attack off the coast of Somalia or in West Africa. However, it occurred in the Yellow Sea, in an area between North Korea and China. News reports are still contradictory and any in-depth analysis into this will necessarily depend on the real circumstances of the case. Notably, the incident has not been reported to the IMB Piracy Reporting Centre. In particular, it is not clear whether the incident took place in international waters. The identity of the assailants is also unclear. Some reports indicate that these were members of the North Korean military, while according to others Chinese mafia from the city of Dandong, on the North Korean border, might have been involved, possibly in cooperation with the North Korean military. Several news reports indicate that the vessels, originating from the city of Dalian, were accosted at sea by armed men and forced to sail to North Korea. The ship owners confirmed the capture of the vessels and their crew. According to the owners, the vessels were navigating within Chinese national waters. They also confirmed that the captors have asked for the payment of a ransom of nearly 190.000 US Dollars and have threatened to harm their captives if no payment was made. 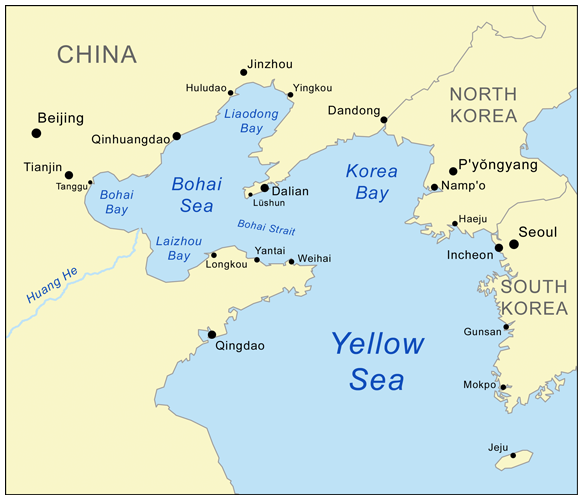 If the assailants have no connection with state authorities, the main issue will be to determine whether the incident qualifies as piracy committed in the high seas rather than armed robbery within China’s territorial sea. However, whether the assailants are members of the North Korean military or not, the use of force and the request for a ransom renders them de facto pirates, because they appear to have acted in pursuit of private ends. If the available information is correct, their actions could also qualify as mutiny. In this regard, it is worth recalling that Article 102 UNCLOS encompasses acts of piracy committed by a government ship whose crew has mutinied. 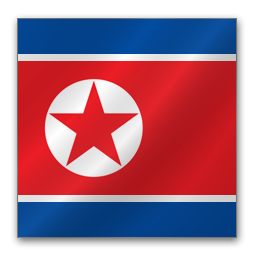 Actions by the North Korea authorities have in the past drawn widespread international condemnation. However, it is difficult to envisage Pyongyang secretive rulers now embracing a state policy to terrorize fishermen in the Yellow Sea for ransom purposes, particularly when this has an impact on a longtime ally and regional military superpower as China. This latter routinely issues strong protests over fishing related disputes with Japanese, South Korean, Vietnamese or Philippine fishing vessels. China will likely take certain actions to prevent any further escalation of such attacks in the Yellow Sea, as it has done by policing Southeast Asia’s Mekong river from drug smugglers and criminal cartels. However, doubts remain on whether the public outcry sparked by this incident will have an impact on its already strained relationship with North Korea. Furthering its current efforts to enhance international cooperation to tackle piracy, the United Kingdom recently became the 18th party to the Regional Cooperation Agreement on Combating Piracy and Armed Robbery against Ships in Asia, commonly referred to as ReCAAP. Entered into force in September 2006, ReCAAP is the first regional agreement for the promotion and the enforcement of multilateral cooperation against piracy and armed robbery at sea in Asia. Among its original contracting parties are South and East Asian countries. Since its entry into force, ReCAAP is also open for accession by other countries. Like the U.K., other global shipping countries with an interest in Asian maritime economy, such as Norway and the Netherlands, are also parties. Pursuant to its Article 1, ReCAAP adopts the same definition of piracy set forth in UNCLOS as well as the IMO definition of armed robbery at sea. However, ReCAAP does not provide for enforcement powers beyond those already provided in UNCLOS. Many of the lessons learned from the implementation of ReCAAP were incorporated in the Djibouti Code of Conduct, which provides a framework for information sharing, training and capacity building in the Gulf of Aden. Notably, ReCAAP established an Information Sharing Centre (ReCAAP ISC), which is now a recognized international organization, headquartered in Singapore. ReCAAP ISC’s main functions include facilitating communication and piracy-related information-sharing among the contracting parties as well as furthering capacity building with other organizations and the shipping industry to develop and improve anti-piracy measures. As part of its mandate, ReCAAP ISC produces periodic consolidated incident reports and alerts on piracy and armed robberies at sea in the Asia region. Incidents are classified under 4 different gravity levels, measuring violence and economic impact. Once piracy hot-spots, the straits of Malacca and Singapore as well as the South-China Sea more recently registered a significant drop in piracy related incidents. Due to improved surveillance and security presence, reported incidents now mainly consist of armed robberies or petty thefts at ports and anchorages, particularly in Indonesia.